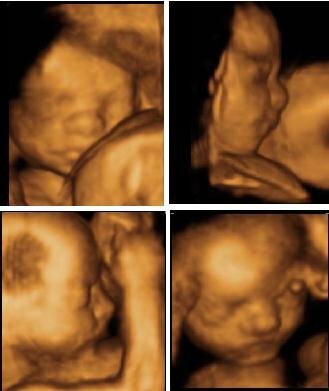 We went yesterday for the 3D/4D ultrasound. We were warned that we may not get any good images because with twins, it is very difficult to see with all the arms and legs moving around in there :). The boys were really active, and we did have to work at it. But, we were lucky and got some really good pictures. The top 2 pictures are of Baby A, and the bottom 2 are of Baby B (sorry, we don't know who is who yet). Of course, we think they are adorable! This was not a regular doctor's appointment, so we didn't do anything to actually see how well the babies are doing. However, the lady doing the ultrasound did measure the boys. One weighs 1 pound, 13 ounces, and the other weighs 1 pound, 14 ounces. So, in all, I am carrying around almost 4 pounds of baby! She said that they were a little bit ahead, but that they may even out later. I am just glad that they appear healthy! Seeing them in 3D/4D makes us even more anxious to see them in person! Only about 3 months to go! The boys look so adorable! I am happy that your mom gave me the link to your site. Unbelievably, our girls turn 1 on Saturday. We really love reading your updates. The boys seem to be doing great. They are really cute. We can't wait to spoil them and hold them.